Views, views, views. Each meeting its proverbial quota -- worthy of a thousand superlative words. So I'll shut up and let the pictures talk. Every one of these views is to be had on a twelve-mile section of the Conestoga trail. It's a one-day, one way, strenuous hike that I can heartily recommend. Find a fit friend with a car. Have him or her follow you in your car to the Lock 12 Parking Lot just off to the north side of PA 372 at the west end of the Norman Wood Bridge. 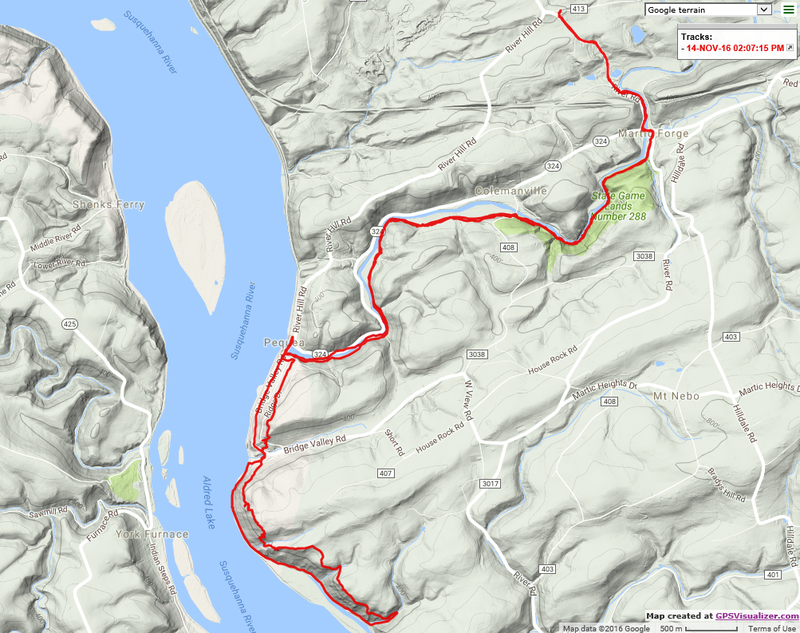 Park one car there and drive the other to the public boat launch ramp at Pequea, PA, at the end of PA 324 where Pequea Creek empties into the Susquehanna River. Pick up the orange blazes at the Pequea Yacht Club, formerly the Arrowhead Marina and before long you're plunging into the woods. 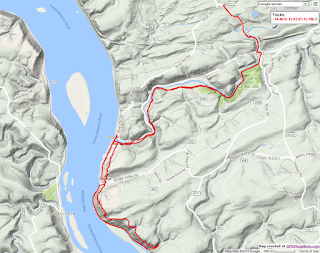 For the rest of the hike you're off the roads, usually deep in the woods, following ravines with tumbling noisy streams, and climbing high onto rocky bluffs overlooking the Susquehanna Gorge. You'll be climbing and descending most of the time, sometimes steeply. But the payoff is well worth it. "No pain, no gain," as they say. 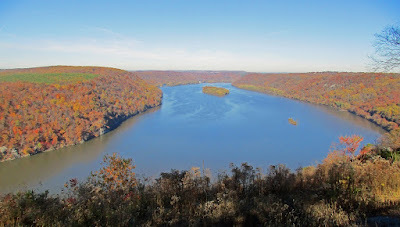 Here are a couple of the finest ravine views, Kelly's Run and Tuquan Glen. Fall color a bonus. At the end you'll be crossing the river on the Norman Wood Bridge. This is Amish Country, with luck you'll be passed by a buggy or two. On the Sunday morning that I came across, I counted four. There are two in this view, though the distant one is just a dark blur. 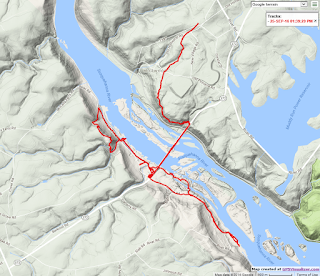 Take some time to check out the interpretive signs at Historic Lock Twelve of the Susquehanna and Tidewater Canal, which runs some forty miles from the Chesapeake Bay up to Wrightsville. This hike has a good guide and a decent map, both free online from the Lancaster Hiking Club. 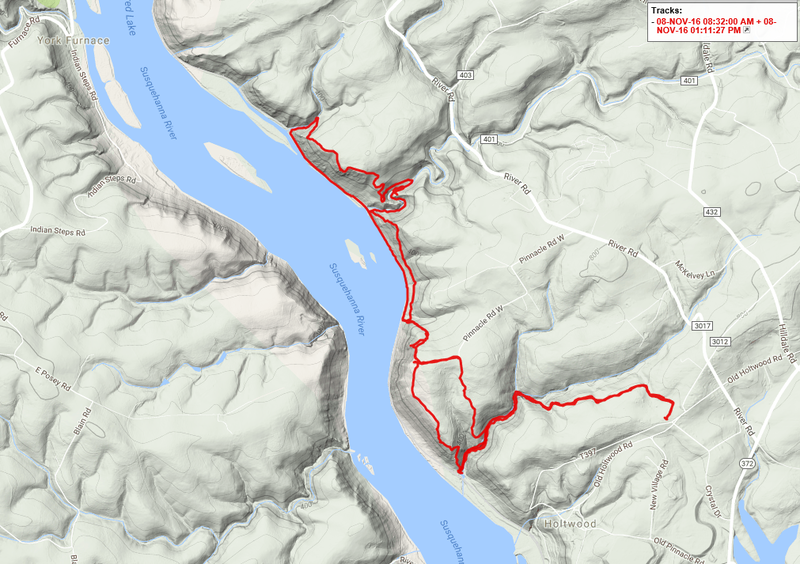 ... and then a few miles hiking deep in the woods, far from any road, and right beside large, noisy Pequea Creek. This is a very easy walk, no climbs at all. Fall Color was resplendent as I passed through. And the witch hazel were in bloom. The highlight here is Suzy's Hole, a whitewater gauntlet tough enough to warrant posted warning signs upstream. At the other end of this gorgeous woods walk, just before hitting a long Conestoga Trail road walk, the trail passes under a hundred-year-old Railroad Trestle. This is an abandoned rail line, and the trestle bed has been rebuilt as part of a rail trail that will be the subject of my next report. A quarter mile connector road near here links the Conestoga Trail with the oddly named Enola Low Grade Rail Trail. Though the Conestoga Trail is finished with the Susquehanna River, the Enola trail takes you back north and west to it for more killer views. Watch this space. 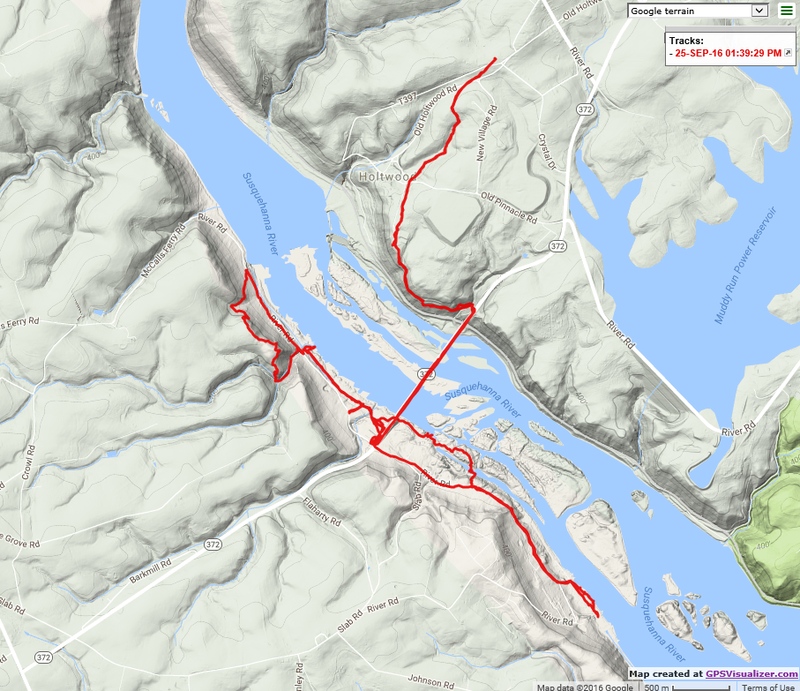 I did this section of the Conestoga Trail in two out-and-back day hikes. Here are the GPS tracks. The southern section from Lock 12 to Holtwood Recreation Park I did as a side trip during my Mason-Dixon trail hiking. For completeness, here's that track. I hope this report raises awareness of this little-known day hike. 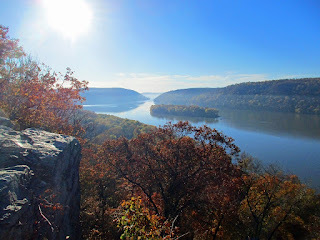 It's one of the most concentrated collection of beauty-spots I've encountered anywhere.